While most wine history buffs like to rhapsodize about the early days of Pinot Noir and its origins in the Central Coast (Chalone and Calera), the Russian River Valley (Joseph Swan and Rochioli), the Santa Cruz Mountains (Martin Ray, David Bruce)), and Santa Barbara County (Richard Sanford), ZD Wines has quietly been continuously producing Pinot Noir for 40 years. Two former aerospace engineers from Sacramento, Norman deLeuze and Gino Zepponi started ZD Wines in a small rented farm building in Carneros in 1968 with the dream of producing the classic Burgundian varietals, Pinot Noir and Chardonnay. The name “ZD” was short for “zero defects,” a reference to their aerospace engineering background. Their winery permit was the first to be issued in Sonoma County in nearly twenty years. Their first vintage in 1969 produced 300 cases of Pinot Noir from René di Rosa’s Winery Lake Vineyard in Carneros and a small amount of White Riesling. This Pinot Noir was historically significance because it was the first wine to have the Carneros designation on the label. A Chardonnay followed in 1971. The winery was a family run boutique operation initially with the partners and their families working on weekends and during vacations. In 1978, the partners acquired a 6-acre plot of land in the Rutherford district of Napa Valley on the Silverado Trail and 3 acres were planted to Cabernet Sauvignon. The next near a new winery was built on the site and deLeuze left his aerospace job to pursue the wine business full time. In 1993, the winery was enlarged and updated. Gino Zepponi died in an automobile accident in 1985, and the de Leuze family bought his shares in the winery. In 1996, ZD Wines bought a historic vineyard in Carneros and planted 7 acres to Pinot Noir. Christened the DeLeuze Vineyard, both Swan and Hanzell heritage selections were planted. The first vintage from this vineyard was 1999 and today grapes from this organically farmed vineyard make up the backbone of the ZD Reserve Pinot Noir. The de Leuze family, now with the third generation becoming involved in the business, continues to manage ZD Wines. Norman’s son Robert was the winemaker until 2001, when he handed the reigns to Chris Pisani who had worked at the winery for several years. Robert continues in the role of Winemaster and CEO. In April, 2009, ZD Wines released the 2007 Founder’s Reserve Pinot Noir, a tribute to the memory of Norman deLeuze, ZD’s founder who passed away in October, 2007 at the age of 75. He was an advocate of the non toxic treatment of diseases and had an ongoing relationship with the University California Davis Oncology Department. This spring, ZD Wines is donating $1 for every paid tasting in the tasting room to the DeLeuze Family University California Davis Endowment for a Non Toxic Cure for Lymphoma. 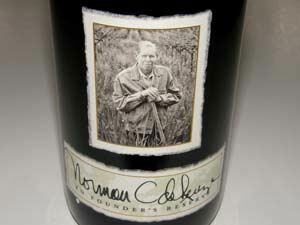 The Founder’s Reserve Pinot Noir is packaged in a bottle displaying a vivid portrait of Norman deLeuze. 13.5% alc., $40. · Heady aromas of black cherry liquor with a faint hint of oak and alcohol. Tasty earth-kissed black cherry and blackberry fruits which are accented by flavors of cola and herbed tea. Lighter-weighted and a tad dilute but offers an appealing soft texture and easy drinking. 13.9% alc., 750 cases, $65. Very cool label. The de Leuze family wanted to reproduce the original photograph from the book Napa-Behind the Bottle by author Bill Tucker. This special release honors Norman de Leuze's favorite varietal and also coincides with the winery's 40th anniversary. Sourced from an organically farmed Napa Carneros vineyard using deficit irrigation, crop thinning and hand canopy management. Aged 15 months in French oak barrels. · A vibrant and expressive nose brimming with aromas of black cherries, strawberries and raspberries in harmony with a subtle riff of herbs. Multifaceted flavors of cherries, raspberries, currants, sassafras, and game. Richer and darker than the regular bottling and packed with flavor, yet almost ephemeral in quality. The tannins are fine grained and the texture all silk and satin. Still drank beautifully the next day from a previously opened re-corked bottle. A very stylish wine displaying the hand of a talented winemaker. ZD Wines is located at 8383 Silverado Trail in Napa Valley. The winery’s tasting room is open daily from 10:00 to 4:30. The wines are sold on the website at www.zdwines.com and through fine wine retail stores. Tours of the 30,000 case per year winery are available by appointment (707-433-1385).